Massive crowds celebrated as the Los Angeles Philharmonic marked its 100th anniversary with an eight-mile long street festival connecting both of its venues, the Walt Disney Concert Hall and the Hollywood Bowl. 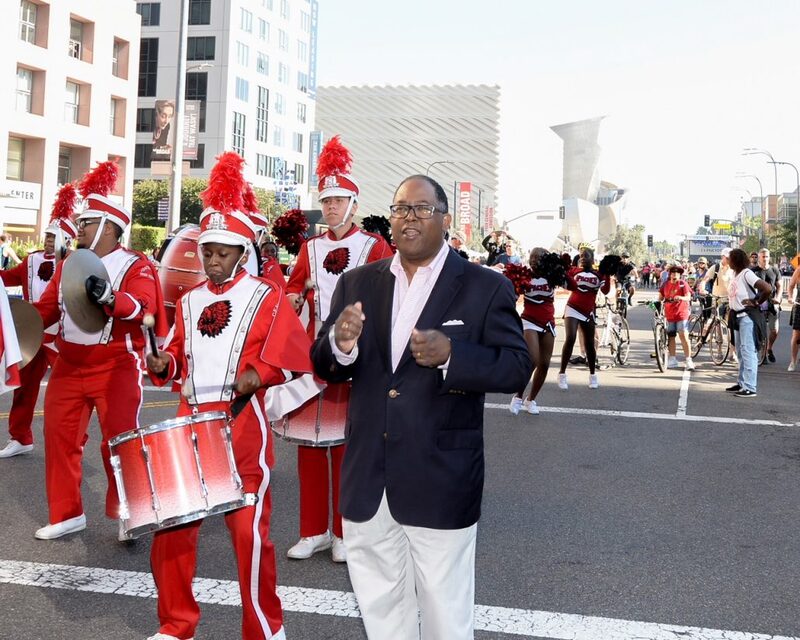 Supervisor Ridley-Thomas marches with the Centennial High School Marching Band from Compton. Dubbed Celebrate LA!, the unprecedented community event featured 1,800 musicians, dancers and visual artists — mostly from L.A. – as well as live shows, food, and family activities. Presented in partnership with CicLAvia and Community Arts Resources, the festival kicked off with a performance by a marching band from Centennial High School in Compton. 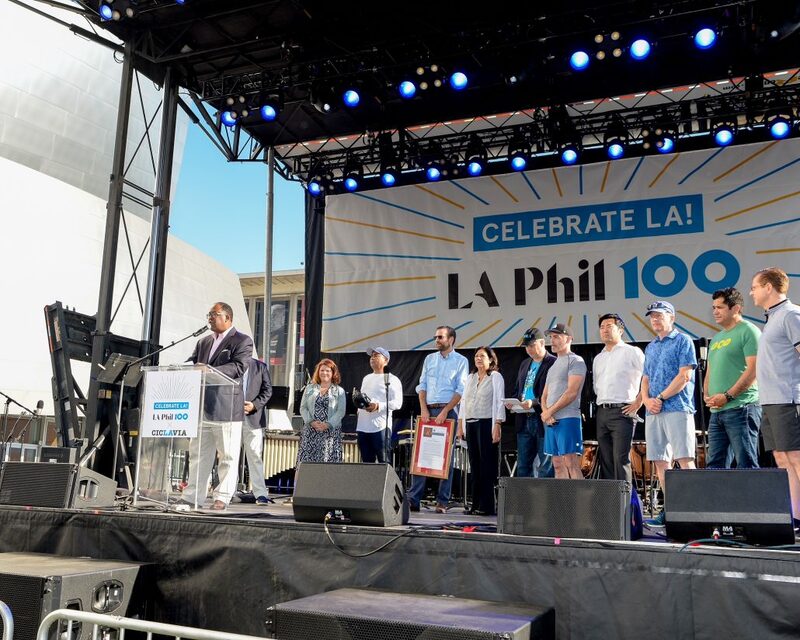 “This Centennial is a chance to rededicate ourselves to the transformative power of music and to the magnificent City of Angels, where we will continue to make magic happen,” said LA Phil Music and Artistic Director Gustavo Dudamel. 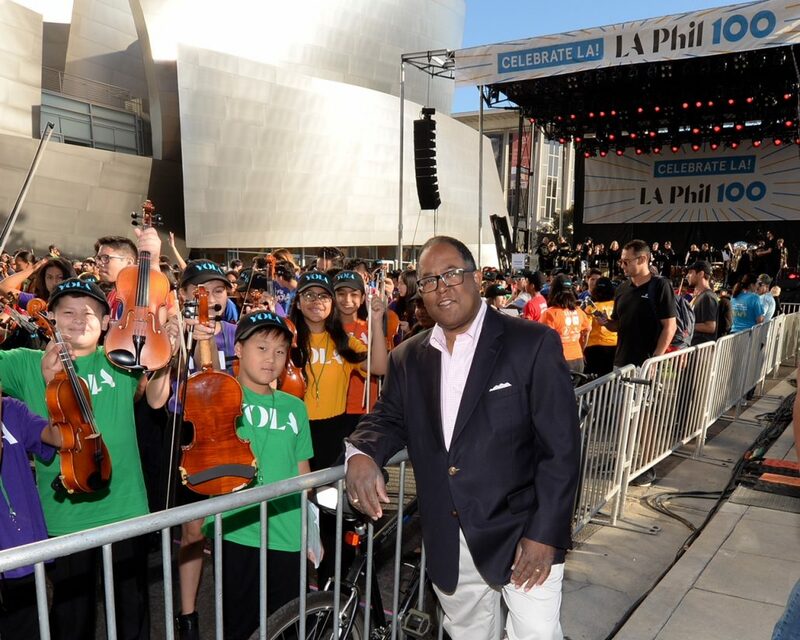 Supervisor Ridley-Thomas with Youth Orchestra of Los Angeles. The eight-mile route was transformed into an auto-free zone, with people walking, running, skating, scooting and biking on the streets instead. Major hubs along the route included Walt Disney Concert Hall, Koreatown, Melrose, and the Hollywood Bowl. Each featured performance stages, art installations, food trucks, screen-printing, kid-friendly activities, dancing, and live music from LA’s best musicians. The festivities culminated in LA Phil 100 at the Bowl, a free community concert featuring Gustavo Dudamel and the LA Phil, and special guests Kali Uchis, Herbie Hancock, and Youth Orchestra Los Angeles. http://ridley-thomas.lacounty.gov/wp-content/uploads/2018/10/2MZ_1771.jpg 1640 2050 admin http://ridley-thomas.lacounty.gov/wp-content/uploads/2017/12/MRT-Banner_nonChairman.png admin2018-10-01 17:16:022018-10-12 10:43:38Celebrate LA!